The Viegli Fund, a charitable organization that, according to its website, has as one of its main goals “realizing the ideas and continuing the values of Imants Ziedonis” (famed Latvian poet that died in 2013), has released the third CD in the Viegli series – Loks paliek vaļā. This CD, continuing in the tradition of 2013’s Vakars. Pietura. 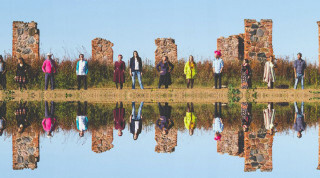 Jasmīns and 2011’s Viegli, features songs with lyrics by Ziedonis performed by many well-known Latvian artists. Many notable Latvian musicians perform on the album, including Renārs Kaupers from Prāta Vētra, Jānis Holšteins-Upmanis (better known as Goran Gora), Māra Upmane-Holšteine from Astro-n-out, singer/songwriter Kārlis Kazāks, composer Raimonds Tiguls, kokle player Laima Jansone, and many others. The fund has begun accepting submissions for the 2016 Laiks Ziedonim award, which, according to the website, are awarded in five categories – science, local history, children and youth, economics and literature. Applications are due by February 26. For further information, please visit the Viegli Fund website and the Laiks Ziedonim website.